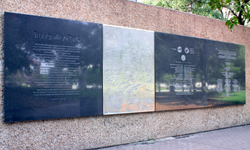 Tranquillity Park was built as a monument to manned spaceflight and Houston’s place in the history of that effort, and nowhere is that theme more effective than in One Step for Mankind, an etched metal image of an Apollo astronaut set in a wall of Tranquillity Park. The shiny silver image is offset by black granite plaques on both sides of it. 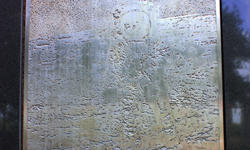 The image was created by Naomi Savage using intaglio, a process by which an image is produced on metal plates using etching tools and chemical baths. The original image came from a film negative taken during the Apollo 11 moon landing. It was installed at Tranquillity Park in 1980. Savage was born Naomi Siegler in New Jersey in 1927. She studied music at Bennington College and art under the direction of her uncle, the famous artist and photographer Man Ray (Emmanuel Radnitsky). She experimented with photographic engraving and made a career of it. Her work can be seen in many permanent collections, and Austin’s Lyndon B. Johnson Library and Museum sports a 50-foot long mural created by Savage. She died in Princeton, New Jersey, in 2005.